Far from the busy 24/7 non-stop world, a place of calm, somewhere to stop and be and reflect on the passing years. Serve-yourself refreshments are always available. A bridle way leads down to the lonely, bird frequented, marsh and the Weavers way long distance path. An RSPB Reserve at Berney Arms is 2 1/2 miles' walk away. When the church was first built the marsh was covered by sea. The dedication of the church is to St. Andrew the fisherman, it suggests Wickhampton was once a fishing community. Inside, the altar tombs of Sir William Gerbygge and his Lady - died circa 1280 – provide single beds on which they await ‘til Judgement Day. In his hands Sir William holds a heart. Legend tells of two brothers and an argument in the course of which they tore out each other’s hearts. Less dramatically, some think he is simply lifting his heart to God in prayer. While romantics are convinced it is an expression oi his love for Lady Gerbygge. Although the church was heavily, perhaps. overly restored in Victorian times, its greatest treasures are untouched. 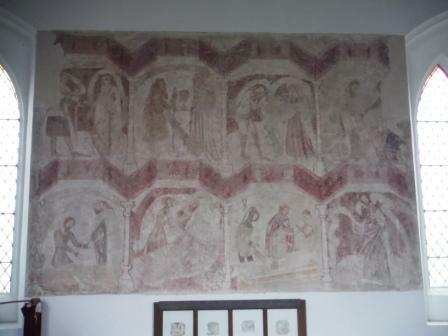 The wall paintings! They include a St. Christopher, The Three Living and The Three Dead and The Seven Acts of Mercy. Each of these is a visual aid to help teach the Christian faith. You too will die; care for your fellow travelers; feed the hungry, give water to the thirsty, clothe the naked, give shelter to the homeless, visit the sick, comfort the prisoner and bury the dead.